This week brings a rich harvest of material on slavery, memory, and public history. First, we have two fascinating filmed conversations. At the Graduate Center at CUNY, James Oakes talks to Sean Wilentz about his new book, Freedom National: The Destruction of Slavery in the United States, 1861-1865. And at the New-York Historical Society, Harold Holzer speaks with Tony Kushner on the subject of Lincoln (and, of course, Lincoln). Next, we take a look into slavery at Jefferson’s university. 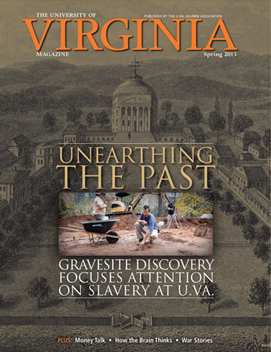 In an article in University of Virginia Magazine and a blogpost for Encyclopedia Virginia, Brendan Wolfe contextualizes a recent archaeological discovery. In the Washington Post, meanwhile, J. Freedom du Lac reports on Colonial Williamsburg’s difficulty recruiting slave interpreters. And how did 19th-century African American portray their own emancipations? Good interviews Deborah Willis and Barbara Krauthamer about their photographic history.